The common, or coarse-haired, wombat, Vombatus ursinus, is a small marsupial that inhabits mainland Australia, Tasmania, and the islands of the Bass Strait. These superficially bear-like animals are members of Diprodontia, a large taxon that also includes koalas, possums, wallabies, and kangaroos. This seemingly diverse group is diagnosed primarily by a combination of two characters, diprotodont dentition (the two enlarged middle incisors of the lower jaw project forward) and syndactylous hindfeet (the second and third digits are joined together by integument). Other osteological features that unite Diprodontia include three or less upper incisors, selenodont (crescent-shaped) upper molars, an expanded squamosal epitympanic wing in the roof of the tympanic bulla, and a complex morphology of the glenoid fossa in the basicranial region of the skull (Nowak, 1999). The behavior patterns of the common wombat are not well known due to their timid nature, but they do construct complex burrows and forage for grass, roots, and fungi primarily at night. The wombats (including V. ursinus and the hairy-nosed wombats, Lasiorhinus latifrons and L. krefftii) are the only marsupials that are convergent with rodents and rabbits in that they have ever-growing incisors (in fact, all of their teeth are rootless and ever-growing) that have enamel on the labial and lateral surfaces only and exhibit a large diastema between the incisors and premolars (Nowak, 1999). 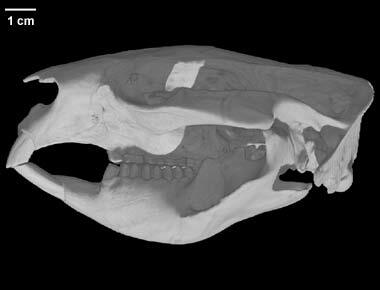 The skull of Vombatus ursinus was made available to the University of Texas High-Resolution X-ray CT Facility for scanning by Dr. Timothy Rowe of the Department of Geological Sciences of The University of Texas at Austin. Funding for scanning and image processing was provided by a National Science Foundation Digital Libraries Initiative grant to Dr. Rowe. The specimen was scanned by Matthew Colbert on 3 September 2003 along the coronal axis for a total of 399 slices. Each slice is 0.45 mm thick, with an interslice spacing of 0.45 mm and a field of reconstruction of 132 mm. Archer, M. 1987. Possums and Opossums: Studies in Evolution. Surrey Beatty and Sons, Sydney, Australia. Beier, K. 1981. Comparative investigations on the teeth of Lasiorhinus latifrons and Vombatus ursinus. Zoologischer Anzeiger 207:288-299. Nowak, R. M. 1999. Walker's Mammals of the World, Vol. I. Johns Hopkins University Press, Baltimore, Maryland. Scott, G. G., and K. C. Richardson. 1988a. Appendicular osteological differences between Lasiorhinus latifrons Owen 1845 and Vombatus ursinus Shaw 1800 (Marsupialia: Vombatidae). Records of the South Australian Museum (Adelaide) 22:95-102. Scott, G. G., and K. C. Richardson. 1988b. Osteological differences of the axial skeleton between Lasiorhinus latifrons Owen 1845 and Vombatus ursinus Shaw 1800 (Marsupialia: Vombatidae). Records of the South Australian Museum (Adelaide) 22:29-40. Scott, G. G., K. C. Richardson, and C. P. Groves. 1988. Osteological differences of the skulls of Lasiorhinus latifrons Owen 1845 and Vombatus ursinus Shaw 1800 (Marsupialia: Vombatidae). Australian Journal of Zoology 36:599-609. Triggs, B. 1996. The wombat: common wombats in Australia. Australian Natural History Series, University of New South Wales Press, Sydney, Australia. Click on the thumbnail to the left for a pitch animation (2.0 mb) of the isolated Vombatus cranial endocast. Click on the thumbnail to the left for a roll animation (1.5 mb) of the Vombatus cranial endocast highlighted in red within the skull, which is rendered semi-transparent. Click on the thumbnail to the left for a roll animation (2.0 mb) of the isolated Vombatus cranial endocast. To cite this page: DigiMorph Staff, 2004, "Vombatus ursinus" (On-line), Digital Morphology. Accessed April 25, 2019 at http://digimorph.org/specimens/Vombatus_ursinus/.